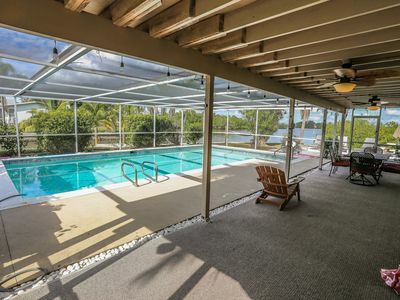 BR: 5 (3 King, 2 Queen); Baths: 4; Sleeps: 10; Pool: Electric Heated; Spa: Yes; Canal: Yes - River/Gulf Access; Boat Dock: Yes; Boat Lift: Avail; Exposure: East; 4251 sqf; Year built: 1973 - Remodeled; TV: 5; Free WIFI: Yes. 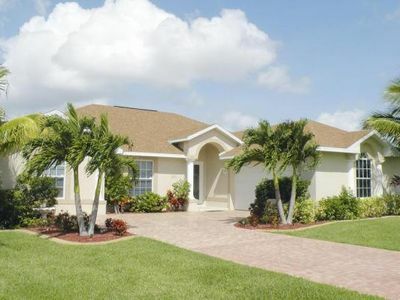 You will find Villa Diamond on the River in the quiet, upscale southeastern riverside area of Cape Coral, directly at the shore of the mighty Caloosahatchee River. 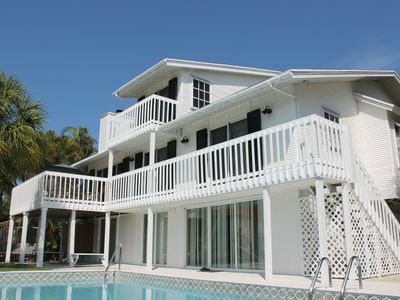 The large waterfront property offers all-day sun and a spectacular view of Florida's largest river. 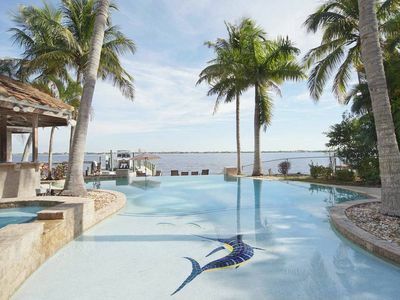 From the sundeck to the pool bar at the infinity pool and spa you will watch luxury yachts and fishing boats gliding along on their way to the warm waters of the Gulf of Mexico. The available boat lift will hold up to a 20 foot boat, but there is plenty room to dock a larger boat. There is also 220 volt power available at the dock for those that need electricity for their boat. As soon as you enter the foyer, you immediately recognize that Villa Diamond on the River is truly extraordinary. 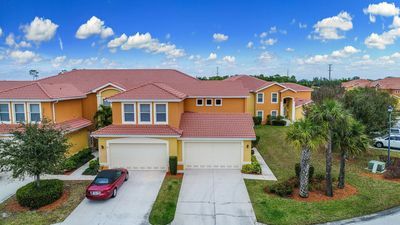 This amazing Spanish-style villa has been built with only the finest materials, which include mahogany wood and marble floors, custom made cabinetry, and granite countertops. 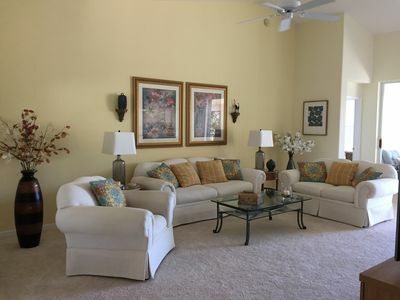 Rarely do you find a home with two King-size master suites, one additional King-size master bedroom and two Queen-size bedrooms all beautifully decorated. 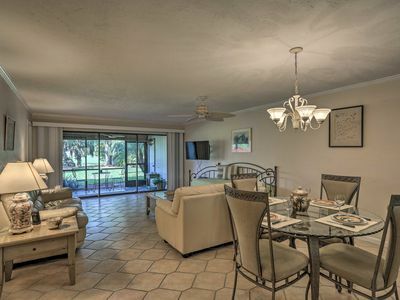 The spacious master suite has access to the tropical garden and features a wet bar, a walk in closet with mahogany built ins and a bathroom with jetted tub, separate shower and two separate vanities. 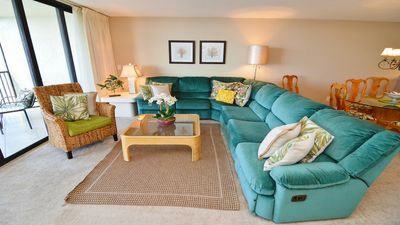 Everyone's favorite place will be the spacious living room with large sofas, fireplace, 80" flat screen TV, DVD player. Villa Diamond on the River is equipped with a multi-room audio system which reproduces a movie theater experience or provides you with the feeling of ultimate relaxation. One universal Bluetooth remote controls sound throughout the entire house and out to the tiki bar. There is an additional entertainment room in the loft outfitted with a queen size sleeper sofa, a flat screen TV and a gaming console. 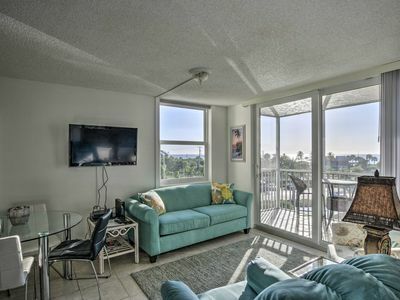 The kitchen is fully loaded with high-quality appliances, including a dual gas oven, microwave, dishwasher, refrigerator, coffee maker, toaster, along with many more items. It virtually leaves nothing to be desired. There is also a convenient breakfast bar. 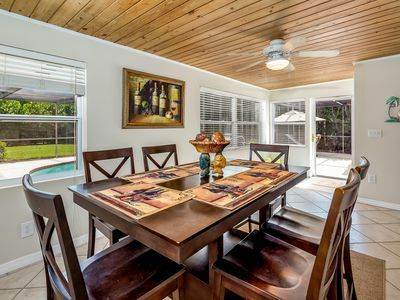 Close by the kitchen is the elegant dining room with seating for 8 persons. The Villa also features an impressive tropical garden with many palm trees and ornamental shrubs, waterfall rock formations, a large heated lagoon infinity edge swimming pool, an in-pool bar, a separate spa and a tiki bar. The garden and sundeck at the river is perfectly outfitted with a dining table, chairs, comfortable lounge chairs and a BBQ gas grill. 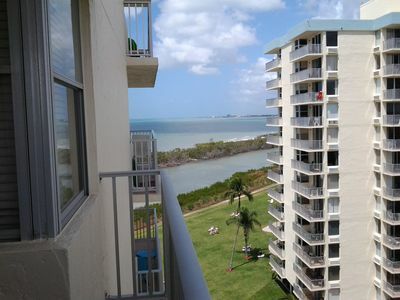 The riverside spacious dock has two boat docks and offers short boat access to the famous beaches on Sanibel, Captiva and Cayo Costa Island, as well as Ft. Myers Beach, Lover's Key and many more. It is a paradise for those who want to unwind from the stress of a busy life and enjoy simple things like sun-bathing, boating, water-sports and fishing. 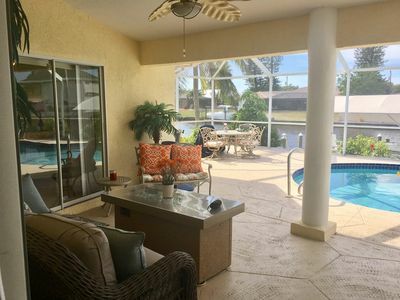 Once you stayed in this outstanding Cape Coral vacation villa you will never forget the impressive views with the ever-changing sunrises turning the river into a huge golden shining pond. For those who wish to be entertained indoors, there are 5 flat screen TVs throughout the villa. Of course, Wi-Fi and internet are available. The garage offers a ping pong table, as well as parking for 2 cars. A variety of shops, restaurants and golf courses can be reached by car within 5+ minutes or so. We also offer the convenient and time saving way to rent such a boat directly from us. One of our licensed captains will provide you with detailed instructions including a short trip on the river. Come to Villa Diamond on the River and enjoy your VIP vacation. All ingrediencies are already here. Rates shown above are for 1-8 guests. 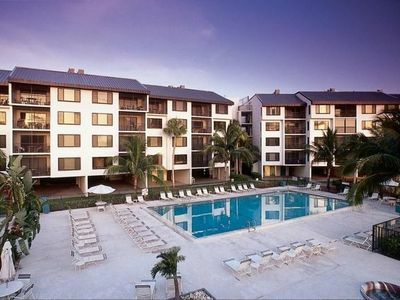 Each additional guest $100/week. No charge for guests under the age of 18. 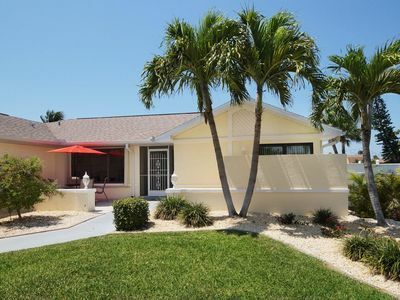 Incredible Bayfront Home with Private Pool and So Much More! 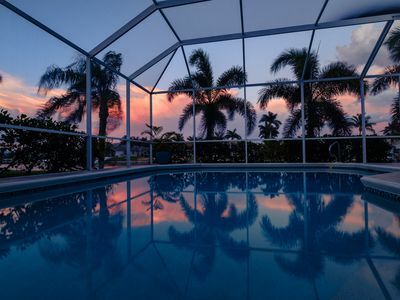 Come home to "Cape Escape" - The sunset views!! Western Exposure!! Santa Maria 105 - WKly -100% Accurate Calendars - Book Online Now! NEW! 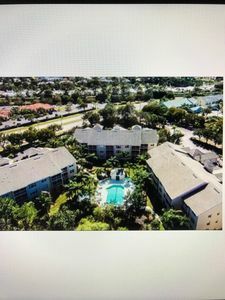 Bonita Springs Condo w/ Pool - Walk to Beach! 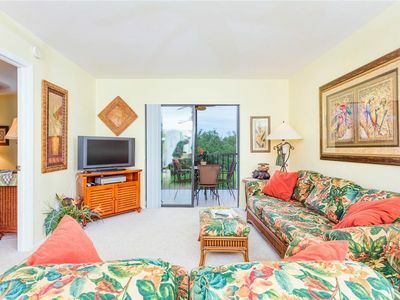 Tropical waterfront villa with heated pool, lanai, boat lift, and tiki hut. NEW! 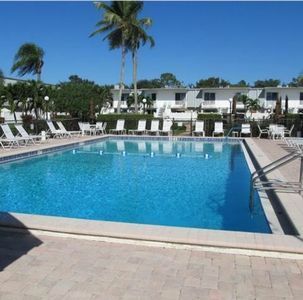 Fort Myers Condo w/ Screened-in Patio & Pool!